This tank must be well planted, but with enough room for the fish to move around. You can add a touch of originality by introducing some transparent species: the glass perch (Chanda ranga) or the glass Silurid (Kryptopterus bicirrhis). 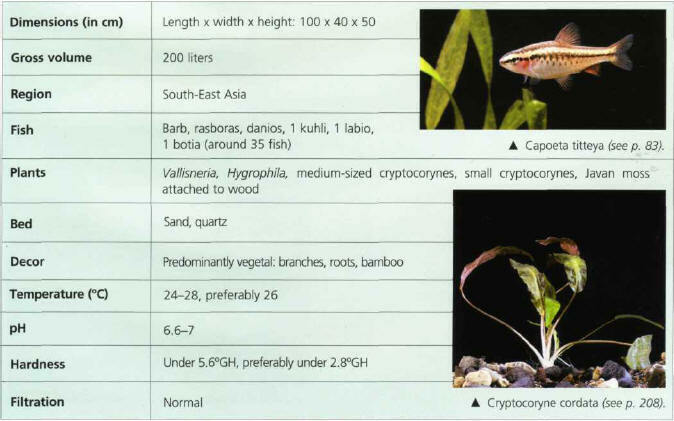 A small shrimp (Atya or Macrobrachium) and gastropods (Ampullaria) can complete the population: the visual effect of the plant decor will be highlighted by the addition of a single specimen of a spectacular specimen, such as Barclaya longifolia or a species from the Nymphaea genus available from specialist nurseries.